Tramps Like Us | Manga Reviews ~ Ramblings of A Fob. I have read the first volume before and was not impressed. But then I decided to gave this series a chance, my initial impression was changed, Tramps Like Us is actually good. Basically the targeted demographic of this series are female readers in their late twenties or ealy 30 hence it’s a Josei genre. It’s a story about a woman named Sumire Iwaya who is smart, beautiful, has a stable job that pays well but then she’s lonely. She does not have much of a success when it comes to love. One day she found a homeless young man inside of a box, and decided to take him in. His name is Takeshi, although in order for him to stay in Sumire’s place he’ll be her “Pet”. Takeshi agreed and thus he is given a new name, “Momo” after Sumire’s deceased dog. The premise might seem quite ridiculous but it works for this series. It’s an unusual concept, but the contents contained in this series were informative regarding to female’s dilemma and such nature. It’s rather a slice-of-life series as close as it can get to real life. It’s much of a study of relationship, characters and things we face each day. Sumire is an interesting character, she’s relatable, she hates it when guys would feel inferior towards her. The series mostly focused on her inner thoughts, troubles and what not. Momo seemed like a laid back character, he’s pretty much acting like a real pet. He might have some interesting background story that we might get a flesh later in the story. But for now this volume was all about Sumire; their unusual relationship, the developing romance between her and her former classmate, her job at a newspaper company etc..
It’s also interesting to read some bits of info about pets relationship (the real pets) towards their owner. Sumire and Momo’s relationship is just starting out (whilst just as “Pet”) but I’m looking forward to how it will develop into real lover relationship. 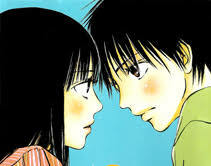 At the end of the volume, it looked like Sumire has found herself a boyfriend although most of her thoughts were of Momo. Perhaps a foreshadowing of where this blossoming romance she had just newly found would end up. I’m amazed that the art didn’t irked me considering it’s not eye catching. Abit sketchy and plainly dull. A good start for a genre I am unfamiliar with but the undeniable spur of romance between the main characters is there. Keeping an eye on this one..